It was rather a wet Sunday for Chris,Jenny, Fiona and Barb, but luckily the rain stopped for setting up and packing away! 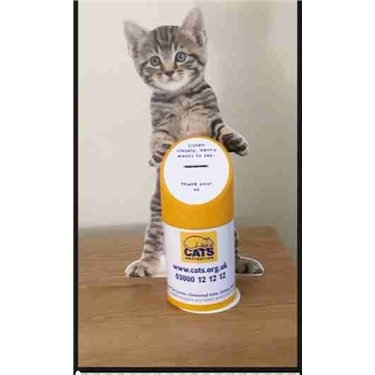 Our new collection box ‘Henry’ was a great success, as he miaowed whenever someone put a coin in and we met a lot of customers who had seen Henry on our Facebook page. Some of our customers told us tales of their cats who had disappeared but turned up after a couple of days. One couple thought that their cat had possibly been shut in at Hoeford bus depot! Another lady bought two of our lovely CP bags and is now the proud owner of all the different ones we sell. We received £11.50 in donations and we sold CP goods to the value of £46.95. Many thanks to our volunteers and our transport man, Ian.